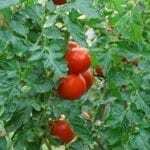 You can thin the multiple seedlings by either doing what you said, cutting out the weaker or separating out the tomato seedlings and repotting individually. I always have trouble just tossing or killing off healthy seedlings; even if I have enough plants, I can share extras with another gardener. I would suggest you prepare a few extra pots with a good light potting soil. Prick out the seedlings and carefully place them down into the soil. 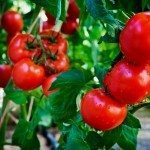 Plant the tender seedlings down as far into the soil as you can get them and gently tamp down the soil around the stem. One seedlings per 3 inch pot. This will help you with the leggy stems and help give them a good strong root system. Then make sure you give them adequate lighting. Add a grow light if you don't have a sunny enough window. Your little tomato babies look very healthy, so keep up the good work!